Huygens Measures Wind Speeds On Titan - Solar System Planets And Moons Section. signals from Huygens Image credit: ESA. Radio Telescopes around the world listened for signals from Huygens to measure wind speeds on Titan as the probe descended through its atmosphere last month. The Telescopes discovered that winds on Titan are very weak near the surface, and then increase in intensity with altitude. Huygens passed through winds going nearly 435 kph (270 mph) at an altitude of 120 km (75 miles). Cassini was originally supposed to make these measurements, but there was a configuration problem with one of its receivers. Using a global network of radio telescopes, scientists have measured the speed of the winds faced by Huygens during its descent through the atmosphere of Titan. This measurement could not be done from space because of a configuration problem with one of Cassini’s receivers. The winds are weak near the surface and increase slowly with altitude up to about 60 km, becoming much rougher higher up where significant vertical wind shear may be present. Preliminary estimates of the wind variations with altitude on Titan have been obtained from measurements of the frequency of radio signals from Huygens, recorded during the probe’s descent on 14 January 2005. These 'Doppler’ measurements, obtained by a global network of radio telescopes, reflect the relative speed between the transmitter on Huygens and the receiver on the Earth. Leading the list of large radio antennas involved in the programme were the NRAO Robert C. Byrd Green Bank telescope (GBT) in West Virginia, USA, and the CSIRO Parkes Radio telescope in Australia. Special instrumentation designed for detection of weak signals was used to measure the 'carrier’ frequency of the Huygens radio signal during this unique opportunity. The initial detection, made with the 'Radio Science Receivers’ on loan from NASA’s Deep Space Network, provided the first unequivocal proof that Huygens had survived the entry phase and had begun its radio relay transmission to Cassini. "Our team has now taken a significant first step to recovering the data needed to fulfil our original scientific goal, an accurate profile of Titan's winds along the descent trajectory of Huygens," said DWE’s Principal Investigator Dr Michael Bird (University of Bonn, Germany). Winds on Titan are found to be flowing in the direction of Titan's rotation (from west to east) at nearly all altitudes. The maximum speed of roughly 120 metres per second (430 km/h) was measured about ten minutes after the start of the descent, at an altitude of about 120 km. The winds are weak near the surface and increase slowly with altitude up to about 60 km. 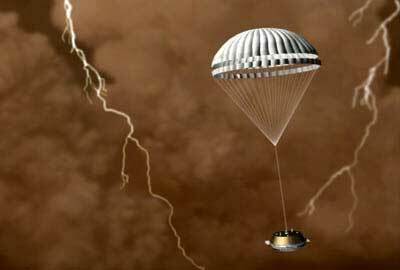 "Major mission events, such as the parachute exchange about 15 minutes into the atmospheric flight and impact on Titan at 13:45 CET, produced Doppler signatures that we can clearly identify in the data," Bird said. "This is a stupendous example of the effectiveness of truly global scientific co-operation," said Jean-Pierre Lebreton, ESA Huygens Project Scientist. "By combining the Doppler and VLBI data we will eventually obtain an extremely accurate three-dimensional record of the motion of Huygens during its mission at Titan," he concluded.